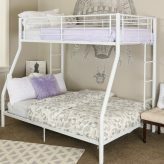 Metal bunk beds twin full will sleep 3 single people. 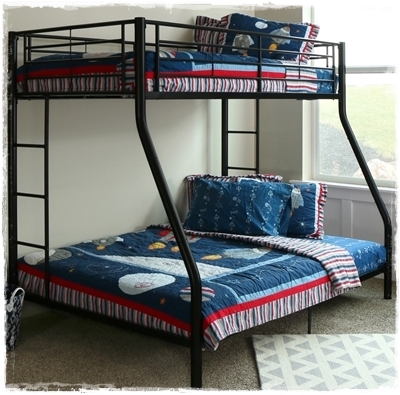 Our metal bunk beds can be used by adults as the weight limit for the twin bed is 250 lbs. while the weight limit for the full bed is 300 lbs. 3 sleeper bunk beds are ideal for large families where the children need to share a room or for the family who has frequent overnight guests. Even vacation homes and beach homes can benefit from bunking it. Fixed ladders and full length guardrails offer safety while the durable powder coated finish will keep the bed looking new for years. 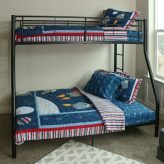 Furnish your vacation home with metal bunk beds twin full. Metal bunk beds are easy to assemble and move making them ideal for dorm rooms, small apartments, cabins, lodges, or camp bedrooms. The simple, contemporary design makes them blend into any decor. The safe sturdy construction and lower price tag makes the a wise, economical choice! Maximize your sleeping space with metal bunk beds twin full!